Well, I’ve been working with Peat on retrieving nearly each day for the past couple of weeks. I got him to the point where he’d retrieve the bumper (with chukar wings duct taped to it) without any assistance from the check cord. Then I got him to do it without the rope. All of this was in my yard, mind you, and most of the retrieves were bribed with treats. But he made fast progress. In the meantime Leslie has been working with Peat every day on basic obedience, and we just started doing e-collar conditioning with him. He’s responding well. Then my brother and his youngest son, a senior in high school, visited over the weekend for some chukar hunting. On Saturday, true to my word and a small shred of common sense, we did not take Peat. We did a big hike and saw plenty of birds, but shot miserably (especially me). Still, it was a gorgeous day in a spectacular spot. I wished we could have taken Peat, but it was good to have Angus by himself. 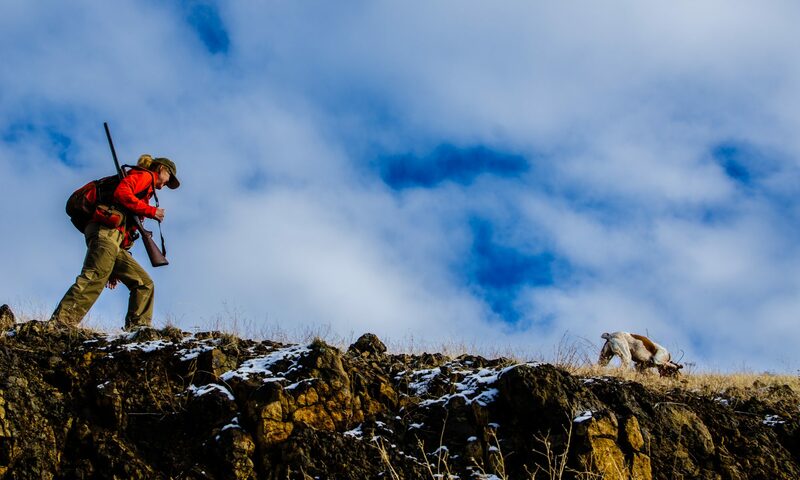 Near the end of the hunt, my nephew and I found ourselves on a ridge looking across at another ridge full of so many chukar calling that I thought I was dreaming. I was fried, but he said, “We have to go after them!” I told him to go for it, take Angus, and I’d watch. My brother was hunting down a different ridge. My nephew is a standout middle-distance runner, and he took off to the bottom of the draw, into the shadows, and then up the brilliant, emerald green, sunlit face opposite me. He climbed it like it was flat, and Angus zigzagged his way up in front. They got to some rocks and I could see Angus stop, and he’d scurry over, and then shoot. Angus bolted to a spot, grabbed a bird and brought it back to him. They did it again, and then continued up. This is a movie I’ll watch over and over until I lose my memory. It’s already a classic. The next day we hunted in a different area before they had to head back home. We took Peat, as well as Angus. I was worried, but we all knew the risks. We climbed up a long ridge and got to some rocks at the top on a slope facing the sun. Angus got birdy and headed down into the rocks, and pointed. Peat crept just behind Angus, and when the chute they crept down narrowed Peat and Angus were side by side and then stopped. A single chukar went up and my brother and nephew knocked it down. I’d moved below them, and came around a rock to see Angus and Peat playing a gentle tug of war with the chukar. “Oh no, here we go again,” I thought. Angus looked more determined not to let Peat have it than he’d been on previous occasions. The odd thing is that both dogs appeared to be concerned not to damage the bird. Finally, Angus let go of the chukar and I expected to see Peat dash off down the hill with it. Instead, he turned toward me, ran right up to me and dropped it at my feet! His eyes and face almost looked as if he were apologizing for taking so long to do this. Needless to say, I was ecstatic, and praised him prolifically. Alone with Peat – he did great! After that, we split up; Leslie and I went with Peat and my brother and nephew went down different ridges with Angus. At the bottom we all joined up again and found a covey of quail in the shady, snowy, brushy draw. We knocked down a couple, and Peat retrieved one of them to my brother (I was down at the bottom of the draw). Maybe it was a fluke. Maybe not. I’m still working with him. He didn’t do so well in the yard today (I didn’t include treats, and it was a different dummy). We still have a ton of work to do, but I’m happy with the luck, or progress, or whatever it was, on Sunday. It meant a lot to me to have those two days with my brother and nephew because they got to see one of the most miraculous things about my world – the tremendous scenery of Hell’s Canyon on a bluebird day in November after a little snow, lots of birds, good dog work, and all on public land where we basically had the place to ourselves. Sharing that with people I care about, and whom I know appreciate it in similar ways, makes life rich. So beautiful in many ways. Thanks for writing. Bob, so glad to learn that Peat is making progress!! Beautifully written piece. Thanks, Angie. We planned to Hunt the OX at Indian Creek, but it’s closed – new sign at the corral (October 15-December 31). So fun to hear your hunt with Geoff and Porter. They had a great time! What beautiful country. Wish you could have joined us, April! What other sport can you experience success or failure in just one day? The success of the weekend with the brother & nephew was sweet. The failures of the past are just an obstacle to overcome. That’s y I love to Chuckar hunt. Good job bring Peat along with his training. Thanks, James. Definitely a work in progress with this guy. It’s teaching me something about grit. Thanks for reading. The picture of Saturday’s rest has all the elements of chukar hunting. The steepness of the country, the frozen northern exposure, the green up on one side of the ridge you’re on and the brown cover on the other side. Great pictures and story. Thanks, Larry. That’s one of my favorites shots for all the reasons you listed. Yesterday, however, was a much different, inverted (literally) picture. You feel about how I feel, those hills and hunts are medicinal. Next PostNext Birds or Bird Dogs?